If you think it's difficult now avoiding embarrassing moments from being captured in a snapshot or video by someone with a mobile phone, you haven't seen anything yet. Researchers at the University of Texas at Dallas disclosed this week that they've developed an imager chip that could turn mobile phones into devices that can see through walls, wood, plastics, paper, and other objects. 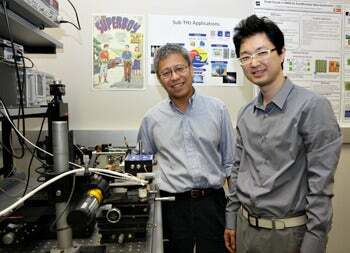 The research team, led by Kenneth O, director of the Texas Analog Center of Excellence and a professor of electrical engineering, tapped an unused range in the electromagnetic spectrum and some microchip technology to brew their X-ray chip. Portions of the electromagnetic spectrum are already used for consumer devices. For example, microwaves are used to cook food, broadcast radio uses AM and FM waves, and infrared waves are used for seeing in the dark. For their purposes, the researchers used waves in the terahertz range. “We’ve created approaches that open a previously untapped portion of the electromagnetic spectrum for consumer use and life-saving medical applications," O said. “The terahertz range is full of unlimited potential that could benefit us all." The researchers' approach reduces the size of the mechanics needed to create images with terahertz waves. Combined with CMOS technology--which is used in a number of consumer devices such as digital cameras and camcorders, smartphones and HD TVs--a chip can be created that can "see" through solid objects. “CMOS is affordable and can be used to make lots of chips," Dr. O explained. “The combination of CMOS and terahertz means you could put this chip and receiver on the back of a cellphone, turning it into a device carried in your pocket that can see through objects." In developing their chip, the researchers, who are concerned about privacy, are focusing on a range of less than four inches. Once the chip hits the mainstream, though, there are plenty of folks, many of them wearing uniforms, who have fewer qualms than the researchers about boosting the range of the chip. Aside from its snooping potential, the chip could have a number of beneficial uses. For example, it could be used in a high-tech wall stud finder and to authenticate documents. Businesses could use it to detect counterfeit money and manufacturers could use it to improve the quality of their products. The chip could have intriguing potential in the medical field, too. It could be used to detect cancer tumors, diagnosing disease through breath analysis, and monitoring air toxicity. In addition to its X-Ray applications, terahertz waves also have communication applications. There are more communication channels available in terahertz than the range than currently used for wireless communication, so information could be more rapidly shared at the terahertz frequency. O's team's research was presented at the most recent International Solid-State Circuits Conference (ISSCC). Next on the team's agenda is to build an entire working imaging system based on the CMOS terahertz system.